As a scrapbooker, I am always looking for ways to marry all of my paper crafting tools into my layouts. That is one of the reasons that Jane Bosi and I produced the Stampbooking CD -- we wanted a perfect marriage of easy-to-do techniques that use Rubber Stamps on our layouts. The Glimmer Masking Tutorial -- the Try That Technique Challenge Technique -- does just that. After you are done here, you should go take a look at what Nancy Dawson and Jane Bosi have done with the technique. Just beautiful results. Today's layout shows the technique used as a background for my page. The glimmered butterfly outlines were just the right simple touch for my page. Now it is your turn! Try that Technique! 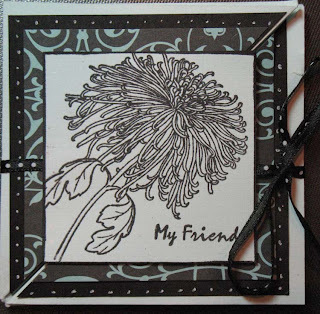 The Stampbooking CD is $17.95 and contains 75 tutorials in pdf format. Order yours today! The Annual CD Sale Starts Today!! All of the Technique Junkie Newsletter annual CDs - CD1 through CD8 - are on sale for $10.00 plus shipping from now through June 30th* (the CD sales does NOT include the TJ Specialty CDs. Only CDs 1 - 8 qualify for this offer). You can order one, two or all 8 CDs - or any combination therein. Simply email me with which CDs you would like and I will send you an invoice with the proper postage amount included. In the US, postage starts at $1.39 for one CD and maxes out at $4.95; In Canada, it ranges from $1.49 to $11.95; and overseas, postage ranges from $2.08 to $16.95. *The three TJ specialty Cds (Emboss or Die, Fancy Folds and Motion and Stampbooking) are not included in this sale. It's Jane Bosi's birthday, and to celebrate, we are having a blog hop! Happy Birthday, Jane! Our hop is all about the techniques on the New Stampbooking CD - Jane was the co-creator of the CD. 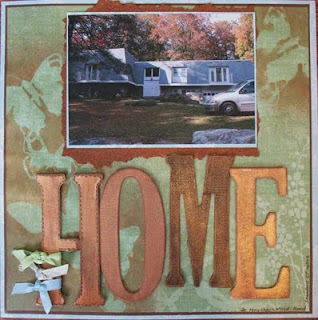 If you came here from Holly Brown's blog, you are on the right track; if not, I suggest you start at the TJ Design Team's Blog to view the whole hop. 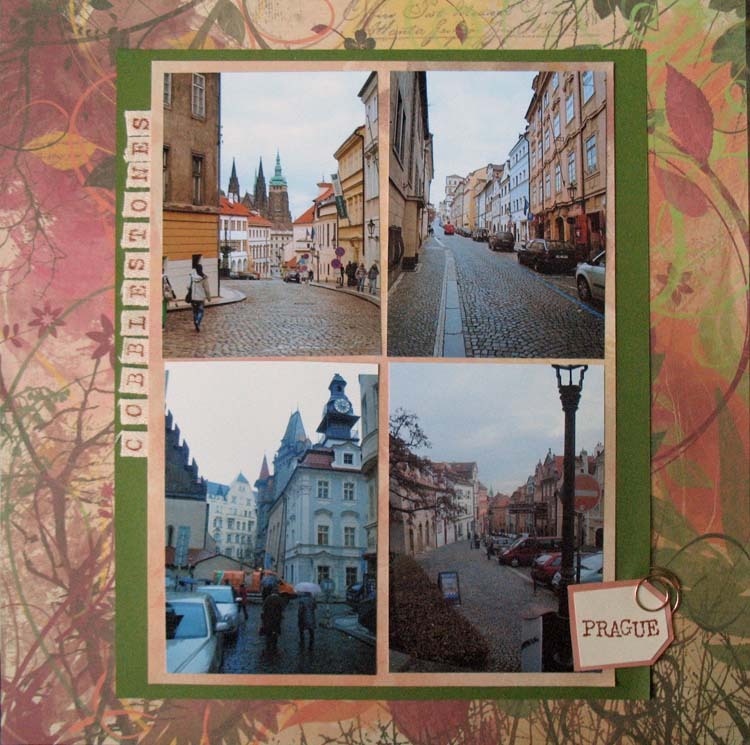 So today, I actually have TWO pages to share -- I could not pick just one, and virtually every page I have scrapbooked the past three months have used the Stampbooking Techniques. The first page, above, uses the Ribbon Titles Technique. I chose this quick and easy page to show the the techniques can enhance the simplest of pages! Stamps: Close to My Heart, Hampton Arts. Again, a great example of how to enhance your pictures using your stamps! Stamps: Stampin' Up!, Close To My Heart, PSX. You now have one more blog to visit -- the birthday girl's blog! 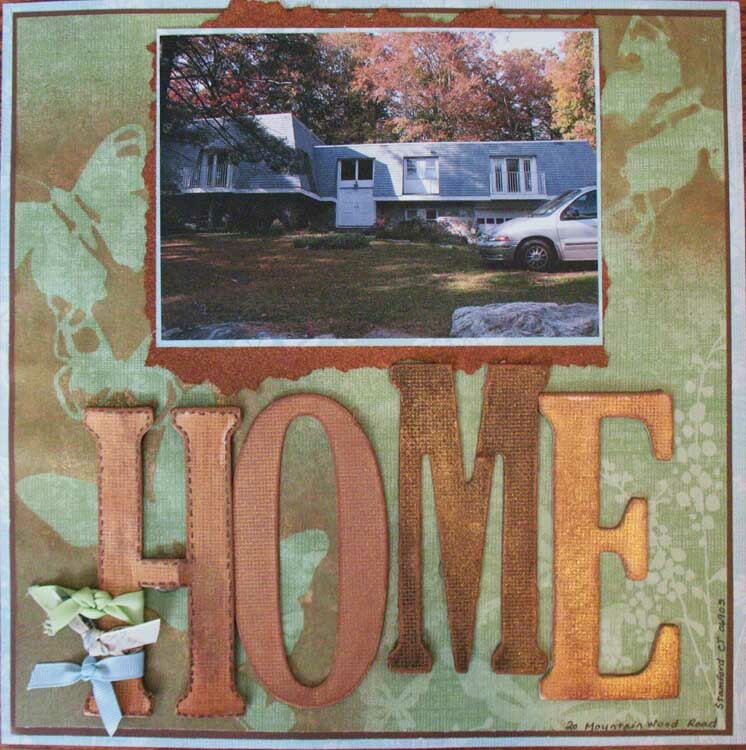 Make sure to leave a comment on Jane's blog to be eligible to win the Stampbooking CD. If you want to go ahead and purchase one HERE, and then you win the hop, I will refund your money! It's ironic. I had two sketch challenges this week, and they were close enough to each other so that I could use the same card! It is Blogger's Challenge Friday, though, so I am sharing it here today under that auspice! 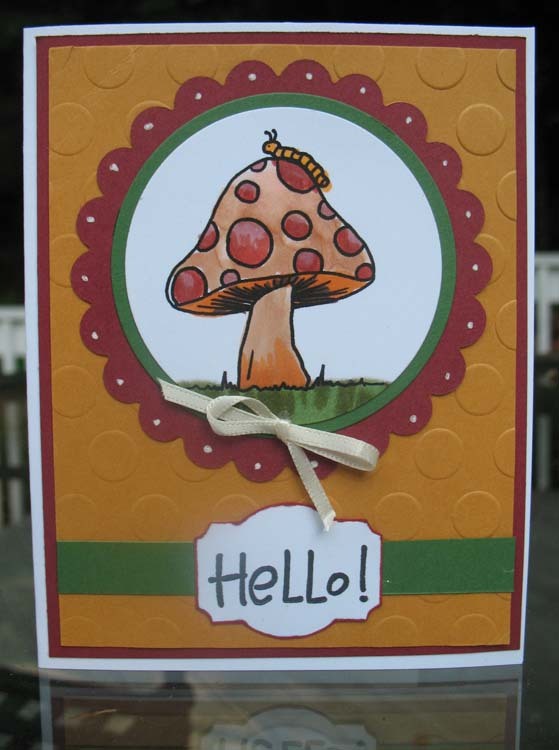 This card uses the Copic Texturizing Technique from the April 2011 issue of the Technique Junkie Newsletter. The image is a cute Sweet 'n Sassy Stamps Digi. The Texturizing is a bit hard to see in the photo, but it is there! I love this cute Digi. And don't forget to use TJNRocks to receive 10% off your order at Sweet 'n Sassy Stamps! You can play along, too. Simply add the link below to your blog post using the sketch to play. Enjoy your weekend! Can you read that and not have the Huey Lewis and the News Song start playing in your head? I can't! 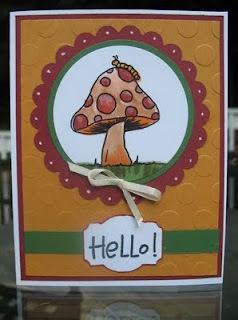 In any case, this card is an example of the Hip to Be Square technique from the Technique Junkie Newsletter Fancy Folds and Motion CD. The CD is still available here. I made this version just slightly smaller than the technique calls for. All of the stamps and the Cardstock used here are from Mark's Finest Papers (When you shop there, make sure to use the promo code TJJuly15 for your discount, too!). I love my Pastel Chalk Pencils. I just love them. They blend so beautifully and have gorgeous, rich, intense color. My first experience with using them was when I bought a set of 10 on sale -- I think I paid $4.00 for them a few years ago -- and I was hooked. I have since purchased a huge set to expand my color palette. If you buy nothing else, think about buying them for coloring skin tone -- they are sublime! They are in my top three favorites of all of my coloring tools. The June issue of the Technique Junkie Newsletter has a tutorial for you on how to blend with them, too. The cute owl above was colored with my Pastel Chalk Pencils. 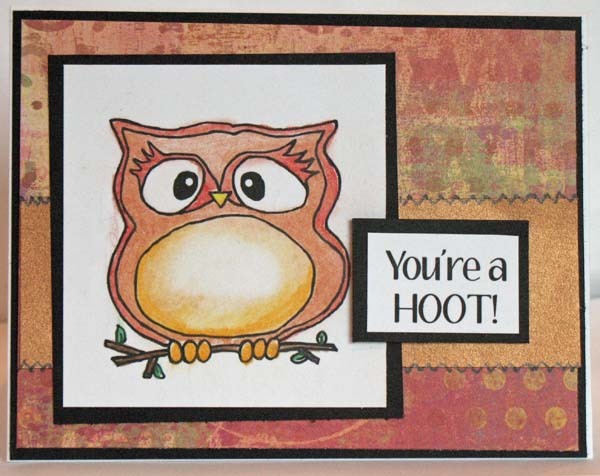 It is a digi from Sweet 'n Sassy Stamps (when you order, use tjnrocks for 10% off!). I love this guy, and his matching saying. The background paper is Basic Grey, but the copper metallic and the other rich, lush papers are all from Paper Temptress.